Getting the right size tablecloth. The size of your tablecloth depends upon the type of table you are trying to cover. If the table is a rental table with ugly legs you will want to cover it with a tablecloth that goes to the floor. In other words, you want to hide the legs. On the other hand, if we are talking about your dining room or kitchen table then we don’t need to go to the floor as the legs are decorative. Also, your home tables tend to have the legs on the outside corners and this will restrict the fabric from moving when your guests are seated and stretch out or cross their legs if your cloth goes to the floor. The ugly rental tables have the legs in the center of the table and therefore the fabric can easily move. 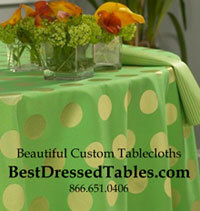 Here is a general rule for choosing the right size tablecloth for table. Ugly Rental Tables. (Height of 30″) Tablecloths to the floor. Take the diameter of your table, add 60 inches to that number and you have the correct tablecloth size. i.e. 48″ round plus 60″ = 108″ round tablecloth. (The 60″ represents the distance from the floor to the table top – 30 inches, and the table top to the floor on the other side – 30 inches.) Always remember that you have to go up, across and back down! Measure the width of the table and add 60 inches and measure the length of the table and add 60 inches. This is the size you need to go to the floor. i.e. Table top size is 36″ x 72″. Add 36 +60 by 72 + 60= tablecloth size of 96″ x 132″. I always recommend that you have rounded corners on rectangular or square tablecloths that go to floor, otherwise the points will be too long. Measure the diameter of your round table or the width and length of your rectangular, oval or square table. Determine the drop: how much you want the tablecloth to hang down from the edge of the table. The standard is 8-12 inches and it is up to your personal preference within this window. Experiment with a sheet to see what looks best with your chairs pushed in or out and what feels comfortable when you are seated. Too much fabric in your lap is a distraction and too little fabric in the drop looks like you got the wrong size. Remember that whatever drop you choose you must add this number twice to your measurements as you have to go down on both sides of the table. i.e. 36″ x 72″ with a 10 inch drop is 36 +20 x 72 + 20. The tablecloth will be 56″ x 92″. #1. Adding a few extra inches onto the length of the tablecloth is a good idea. All fabric shrinks when it is washed and it shrinks more in the length than width. By adding the extra 3-4 inches you will be sure that you don’t have a tablecloth that is too skimpy on the ends after a few washings. 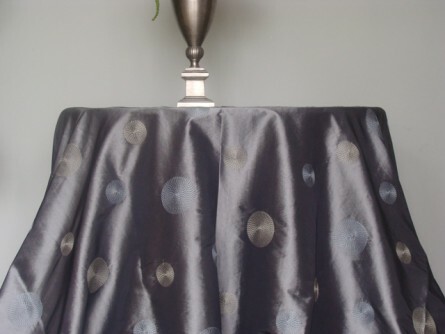 #2.Rounded corners on full length rectangular or square tablecloths keep the points from dragging on the floor.